What are Google Local Services Ads for Roofers? Google Local Services Ads, pictured below, are a newer ad format that directly connects homeowners with qualified contractors. While the program is designed to help homeowners select contractors with confidence, it is also proving extremely beneficial to residential roofers. Keep reading to find out why these new Google ads are critically important to residential roofers. Want your business to show up at the very, very top of Google? Soon, that will require running Local Services Ads in 29 major US markets. This new ad format appears above traditional paid search ads, the Google Maps results, and organic listings. This means roofers running PPC campaigns, but not participating in Local Services Ads, will have competitors appearing above them on Google. While the program is not live everywhere, it is likely Google will eventually extend it nationwide. That’s right, Google Local Services Ads operate on a pay per lead basis. Roofers set a weekly budget based on Google’s recommended cost per lead. Leads are tracked by using a Google forwarding number for all calls. In select markets, leads can arrive as messages, but Local Services Ads really focus on driving direct calls. A hidden benefit is that clicks on Local Services Ads direct to a special Google profile page, so roofers do not have to create optimized landing pages for the campaign. Think the leads will be over the top expensive? Think again. In one market, Google projects a cost of $32 per lead. In others, current clients are paying between $50 and $60 per lead. HomeAdvisor is charging over $100 per lead in the same market. While HomeAdvisor style leads are sold to 4 or 5 roofers and require chasing down homeowners, Google Local Services leads are direct calls to your business. This makes it much easier to set appointments. Feedback from roofers already using Local Services Ads is that the lead quality is significantly better than HomeAdvisor. Again, Google Local Services Ads are a massive marketing opportunity for residential roofing contractors. Google will cover up to $2,000 worth of work for customers who are unhappy after selecting a Google Guaranteed roofer. How can Google guarantee the work? Easy, not every roofer can participate in Local Services Ads. While any roofer can apply, not every roofer will meet Google’s requirements. Roofers must have a minimum amount of positive reviews and submit additional documentation before they are eligible for Local Services Ads. We break down all the entire set up process in the next section. Additionally, roofers who do not follow up with customers or perform poorly, can be removed from the program. Just how serious is Google about contractors performance? Missing two consecutive calls during your business hours via Local Services Ads will penalize your ad listing by reducing how often it appears in search results. This is why Google has put a guarantee on the ads. This in turn increases homeowner confidence in contacting these roofers, since Google is backing them up. After the set up process is complete, there are still best practices to follow in terms of managing your profile and results. This includes consistently driving new Google reviews, responding to negative reviews, adjusting zip code targeting, adjusting weekly bids, and uploading new pictures and information to your profile. 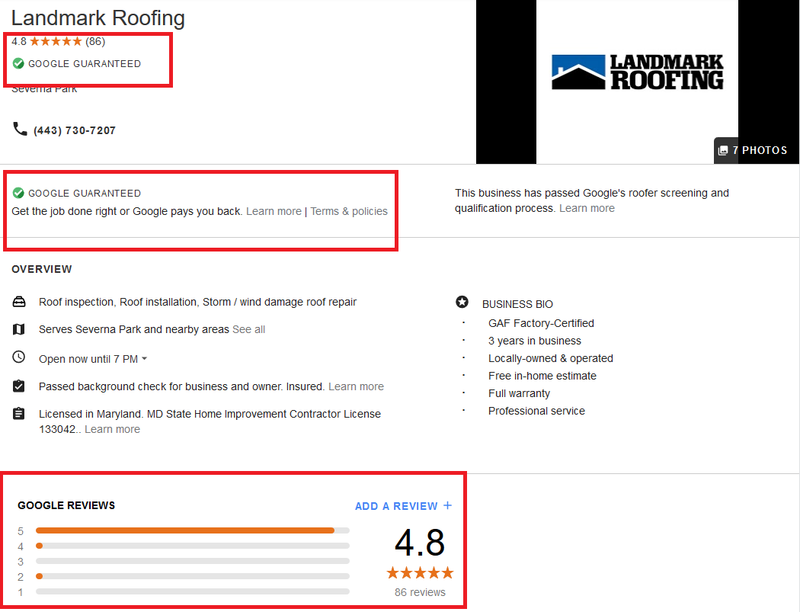 Roofers with great reviews are primed for success with Google Local Services Ads. In both the ads on the search results and the specific business profile, star ratings and reviews are prominently featured. Combined with the Google Guarantee, the listings create a very compelling reason for homeowners to call your roofing business. This is especially true for any roofer with a very high rating and review count. Have you not seen these ads in your local market? The reason is that Google Local Services Ads for roofers are virtually brand new. Roofers can be one of the first in their local market to use these new ads. This is a huge opportunity to start capturing leads before your competitors know what hits them and get up to speed. Yes, this will eventually impact all residential roofers because all signs point to these ads rolling out nationwide in the future. 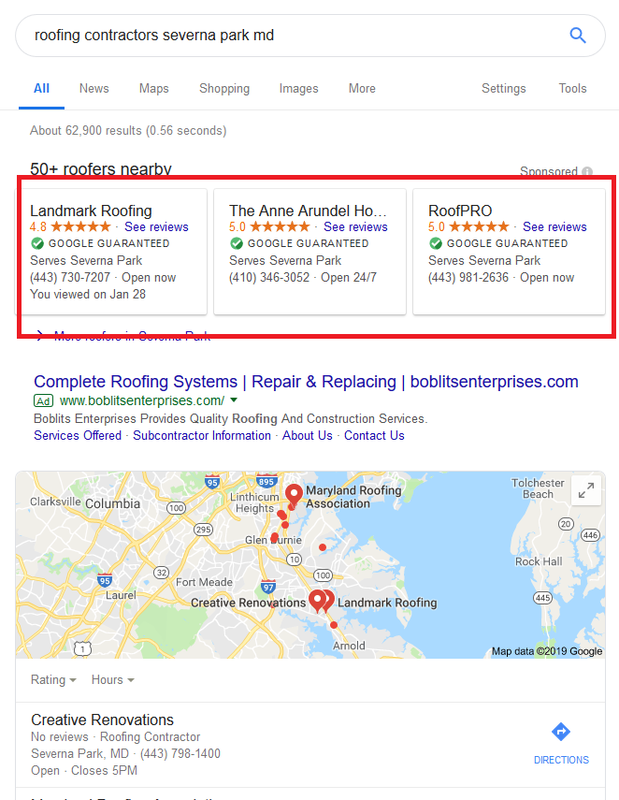 Residential roofers currently using Google Ads for leads are especially at risk if they do not launch Google Local Services Ads. The Local Services Ads will soon appear above their ads which will impact impressions, clicks, and ultimately leads. Need help launching a Google Local Services Ads for your roofing business? Have a question about the process? The team at AltaVista Strategic Partners is here to help. Please call us at 443-960-4004 for a free consultation or reach out using the contact form below. We look forward to helping you!